On Tuesday, Dan Coats, director of the Office of National Intelligence, described the situation in terms that sounded more like what the world was saying before to the Trump-Kim Summit. Coats painted a grim picture of the conflict with ISIS, which continues to command thousands of fighters in Iraq and Syria. The group maintains eight branches, a dozen-plus networks, and followers around the world. In his written testimony, he highlighted the danger of a precipitous troop withdrawal from Syria, albeit indirectly. “The group will exploit any reduction in [counter-terrorism] pressure to strengthen its clandestine presence and accelerate rebuilding key capabilities, such as media production and external operations. ISIS very likely will continue to pursue external attacks from Iraq and Syria against regional and Western adversaries, including the United States,” he wrote. Haspel added that the territorial victories against ISIS in Syria could prove short-lived. She said hundreds of foreign fighters from ISIS remained in the custody of the Syrian government, in a sort of limbo state beyond U.S. influence. "I think it would be very bad" if they were released, she told Sen. Tom Cotton, R-Ark. Coats wrote that China and Russia, which play starring roles in the Defense Department’s National Defense Strategy as America’s main competitors, are growing closer than ever. They are “more aligned than at any point since the mid-1950,” much to Washington’s discomfort, he said. 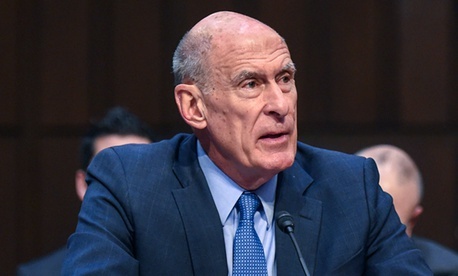 Coats' written statement also describes China’s growing cyber capabilities. “Beijing will authorize cyber espionage against key US technology sectors when doing so addresses a significant national security or economic goal not achievable through other means. We are also concerned about the potential for Chinese intelligence and security services to use Chinese information technology firms as routine and systemic espionage platforms against the United States and allies,” he wrote. While that shouldn’t be controversial, it has become so under Trump, who has come to the defense of Chinese telecom company ZTE. At one point, Cotton asked the witnesses to raise their hands if they would recommend buying a ZTE phone. No hands rose.